The Rendine Constructions team at their new headquarters in Moolap. Rendine Constructions has concluded an exciting year with its category win at the 2018 Deakin University Geelong Business Excellence Awards. The success culminates a year of expansion and progression for the company. 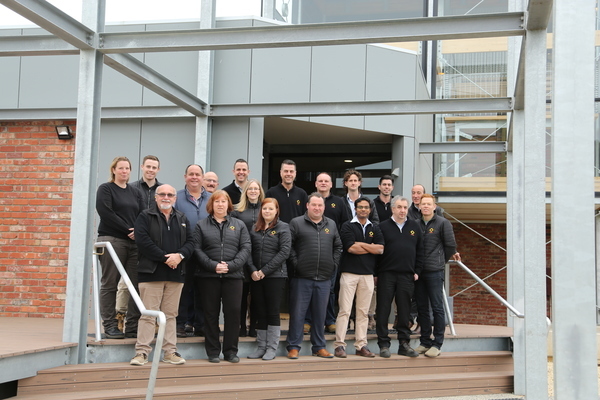 From transforming a worn out shed into a multi-storey, state-of-the-art headquarters to driving business information modelling and moving into the world of manufacturing modular buildings, the company is benchmarking the future of construction in Geelong. Rendine’s vision to create, build and manage “extraordinary construction” has successfully directed the business across four decades and two generations of Mills family ownership. The vision has further driven the diversification of Rendine’s experienced personnel with a repertoire of building services including project feasibility, design, engineering, civil and commercial construction, modular building and maintenance services. “We understand construction. We can deliver a great finish on any job,” says managing director Greg Mills. “But our clients don’t simply want a great finish. They want someone who can manage the process for them, who can anticipate their needs. Rendine is now delivering first-class constructions throughout Victoria for government and private sector clients operating across a host of industries.